Waipa Earth Champions was recently held for the 3rd consecutive year. This year we had 43 students representing 7 schools take part. It was a real collaboration with involvement from Waipa District Council, Enviroschools, Waikato Biodiversity, Te Kauri Waikuku Trust, Waipa Museums, Maungatautari Ecological Island Trust, and Smart Water. Sudents planting on the edge of Lake Ngaroto. The restoration of peat lake health is one of many such programmes in the district. The theme of Global issues, Local Realities was carried through the day with a range of mini workshops run by community experts to engage students in thinking about their role locally. School representatives were given an opportunity to share their successes with others in a 2 minute soapbox session. We also heard from Susan O’Regan, whose son Ben travelled with a group of Waikato Enviroschools reps to Adelaide to the Kids teaching Kids river conference in 2011. Susan talked about how Ben’s preparation for this highlighted for them the importance of farm catchment management. This led to significant changes on their farm and a subsequent recognition at the Ballance Farm Environmental 2015 awards. 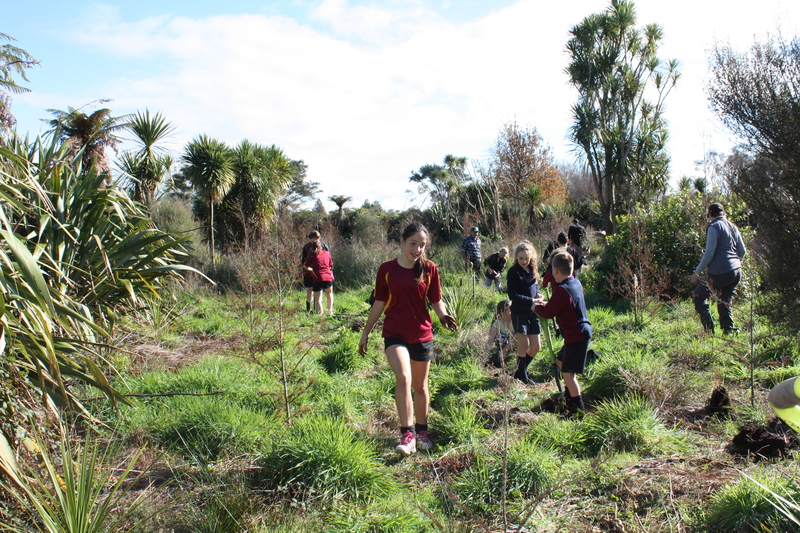 The Waipa Earth Champions programme culminated in a trip out to Lake Ngaroto where the students planted trees as part of the enrichment restoration along the walkway. Waipa Earth Champions 2015 provided opportunities for students to work and learn alongside like-minded students from around the district. Of interest was the response from teachers and supporting adults who were there not only to supervise but to learn themselves and consider ways of continuing the learning back at school. This entry was posted in For teachers, Student event, Sustainable Communities and tagged Global Issues Local Realities, Waipa District by Olive and Miro Studios. Bookmark the permalink.